There are many operating systems available nowadays: Linux, Windows, native operating systems for netbooks or smartphones... If we want to try out all these systems we have two alternatives: create a partition with each of them on our hard drive or on the contrary use a virtualization tool. MokaFive Creator is a tool conceived precisely for that purpose, which is based on VMware Player, that offers virtualization options for practically any operating system that exists at the moment, like Novell, Solaris, Ubuntu, Fedora or any version of Windows, among other options, but one of its most appealing features is that it also allows us to virtualize applications or games on their own, like Quake II or Wine. From the MokaFive website we'll be able to access various virtual machines created exclusively to be used in conjunction with MokaFive Creator, like Fearless Browser (an anonymous browsing system for the Internet), Linux XP Desktop (a Linux distribution that emulates the aspect of Windows XP) or the Windows 7 RC (if we want to try Microsoft's latest system). 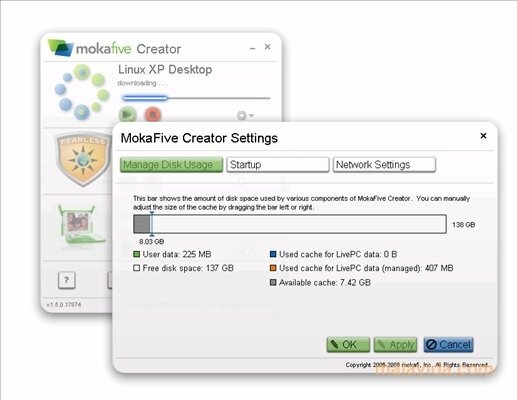 If you want to have access to a free virtualization system, that is intuitive and lightweight, download MokaFive Creator right now. Once installed the application will download the latest version available.